ezRez, a software company that develops white-label travel commerce and loyalty redemption platform and a loyalty payments engine for digital wallets, has acquired social loyalty rewards startup Topguest. Financial terms of the deal were not disclosed. As we’ve written in the past, Topguest is a loyalty program that rewards users for engaging with brands on social networks. The startup lets you earn points simply by checking-in to hotels, airports and more on social networks like Foursquare, Instagram and Facebook. Topguest allows users to integrate with rewards programs such as United MileagePlus, Continental One Pass, Virgin America, IHG Priority Club and Hilton HHonors to earn reward points check-ins and receive exclusive offers and bonuses as well. For example, a Virgin America Elevate member waiting to board a flight can use Topguest to check-in on Foursquare and earn bonus Elevate miles. Topguest recently announced a white-label product that allow brands to customize their communication with each of their customers, based on their social networking activity. Loyalty programs can carefully target and customize offers that are relevant to each member. The startup has raised $2 million in funding from the Founders Fund, SV Angel, SoftTechVC, Keith Rabois, Kal Vepuri, Naval Ravikant, and Joe Lonsdale. Peter Thiel is an advisor as well. Founded in 2003, ezRez works behind the scenes with more than 200,000 travel suppliers, loyalty programs and payment providers globally, including AirAsia, American Airlines, United Airlines, Starwood Hotels, Intercontinental Hotels, JetBlue, American Express and PayPal. The company’s back-end technology that lets you book hotels and rental cars with points and cash through various travel companies’ rewards programs. Collectively, more than 20 billion reward points are redeemed through the ezRez platform annually. ezRez is also rolling out a new digital wallet product that will allow loyalty program members to use their loyalty program points to pay for merchandise and services anywhere PayPal is accepted. 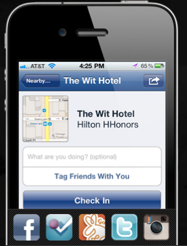 Topguest actually works with many of the same loyalty programs but adds the social and mobile component, rewarding consumers for “check ins” and other social behavior on Facebook, Foursquare, Instagram and Twitter. The integration of Topguest will offer a more comprehensive SaaS-based technology platform for loyalty programs, with the ability to manage how program members earn and redeem loyalty points through both Topguest’s social engagement tools and ezRez’s existing travel booking platform for airlines, hotels and online travel agencies. Points can then be redeemed for travel via ezRez’s loyalty travel platform, or merchandise via ezRez’s new digital wallet product. exRez says that all Topguest employees will be joining the ezRez team and the company will continue to operate Topguest.com and its white label B2B loyalty platform under the current brands. To date, ezRez has raised $17 million in funding from Canaan Partners, Azure Capital Partners and others.